I took 40 of my editors, graphic designers, and assistants to see Courageous on Friday afternoon and we had a tremendous experience. I’d seen it 4 times before its theatical release, so I was curious to see what their reactions were, and I wasn’t disappointed…they loved it. Early predictions are that it will have a strong opening weekend and surprise Hollywood insiders. 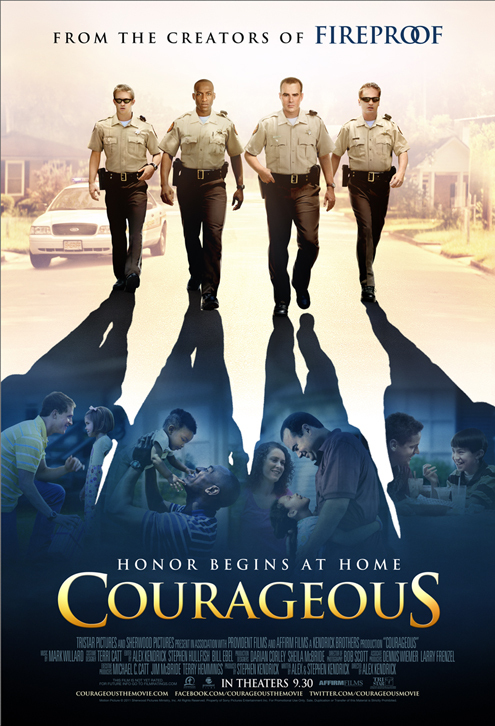 The website BigHollywood posted this on their website today: Courageous – Has the potential for Fireproof like opening numbers ($6.8 million). In fact, look for the film to finish around the $9 million range, easily beating that mark. This healthy opening will surprise Hollywood (in a good way) again. LifeWay has created a partnership with the producers of Courageous and released a 4-week Bible study based on the movie plus other resources for men and women. A more extensive 8-week study will be released in early 2012. Previous Spotlight on Teacher Resource: QuickSource…it’s Really Quick!